Over the course of the week, the panel interviewed various members of the community including representatives from the three Task Forces, Regional Nodes, Project leaders, the National research Foundation, OAD Steering Committee, IAU Executive Committee, the South African Astronomical Observatory, the Square Kilometer Array, Department of Science and Technology (South Africa), etc. The overall findings from the review are extremely positive and supportive of the OAD, its team and the work done in the last four years. Major outcomes include strong recommendations for the continuation of the OAD and to modestly increase its funding and staff. The results of the review, now public, are available at the links below. 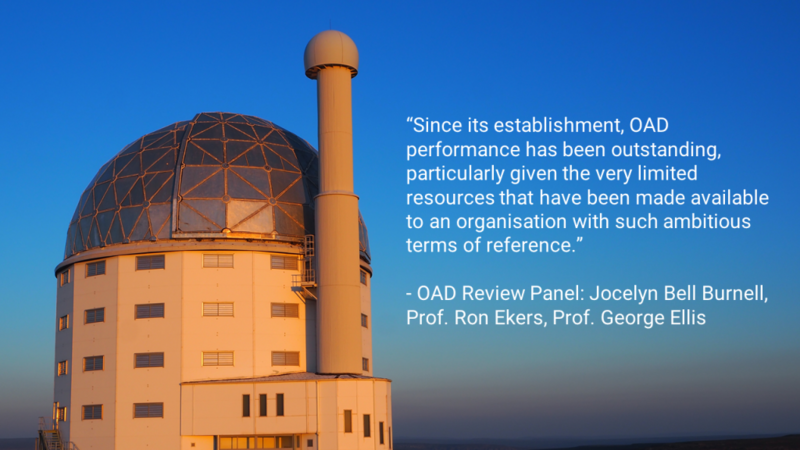 its (OAD) performance has been outstanding, particularly given the very limited resources that have been made available to an organisation with such ambitious terms of reference.